There’s a new look at Carson Hot Springs Spa and Resort in Southwest Washington, a resort located near the Columbia River in the town of Carson. The resort actually opened way back in 1892. It features a hotel, spa, restaurant and now a newly re-opened golf course called Elk Ridge. Washington State has had an excellent year with the opening of two new golf courses, Salish Cliffs and Suncadia’s Rope Rider. This good fortune is not shared throughout the majority of the golfing regions in the country. Sadly, some of these less fortunate courses have closed their doors for good, leaving the golfing faithful to appreciate the value of their favorite local courses. Few courses, however, get a second or even a third chance and for one Southwest Washington community, the third time is a charm and golf is back at Elk Ridge Golf Course! 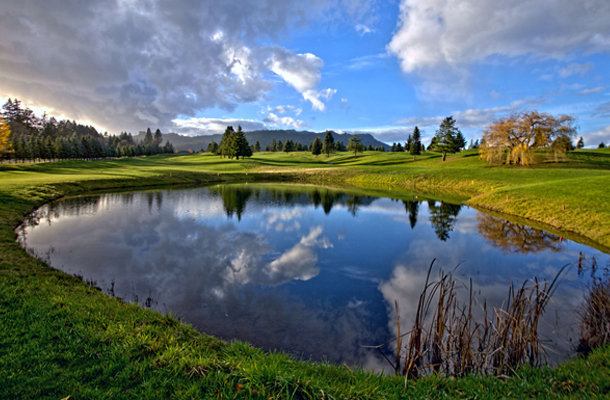 Elk Ridge Golf Course at Carson Hot Springs is located near the Western edge of the Columbia River Gorge. The small town of Carson, Washington is about an hour east from downtown Portland, Oregon and about a 30-minute drive from Hood River. The course itself provides each golfer breathtaking views of Dog Mountain and the Columbia Gorge. Once known as Carson Mineral Hot Springs Golf Course (the home of the historic St. Martin’s Hotel), it had been a ghost town for nearly six years – that is until last July. With an enormous amount of hard work, an extremely dedicated team of local professionals and a good measure of intestinal fortitude – Elk Ridge has a renewed spirit about the greens. Since opening last September, the care and upkeep of the greens and facility is readily apparent and it continues to improve and attract golfers for miles around. The Resort is rapidly becoming a true golf destination and the Hotel’s Wind River Wing expansion is scheduled to open this month. The new rooms will offer golfers accommodations that boast 22 hot tubs rooms that are filled with therapeutic mineral water on private balconies. There are those that purport the mineral waters may even improve your game. As for the playability of the Elk Ridge, well that’s another surprise altogether. According to the Clubhouse Manager, Greg Pederson, “Water drains straight through the soil, even after a week of rain; we’re as dry as can be.” The course plays to 6,461 yards and par 71. The layout boasts 40 intimidating bunkers, a mixture of plateau like holes, along with some steeper climbs and descents throughout. Because of its exposed hillside location, “Wind can be a dominant factor on any given day,” says Greg, “it can play so differently depending on what the wind wants to do.” Undulating green contours are also a persistent challenge, especially in the wind. “Pin placements will be interesting come summer,” says Scott Coogan, Superintendent.